Winco PSBW-5W Plastic Shell Bowl, Pearl 5 Qt. TigerChef > Tabletop > Tabletop Serveware > Salad Bowls and Serving Bowls >< Plastic Salad Bowls > Winco PSBW-5W Plastic Shell Bowl, Pearl 5 Qt. $9.75 Winco PBB-15 Polycarbonate Pebbled Salad Bowl 15"
$2.39 Royal NC 450 CLR Crystalware Salad Dish 6"
$3.10 Winco PSBW-1W Plastic Shell Bowl, Pearl 20 oz. $2.74 Winco PBB-8 Polycarbonate Pebbled Salad Bowl 8"
$4.73 Winco PBB-10 Polycarbonate Pebbled Salad Bowl 10"
$1.43 Winco PBB-6 Polycarbonate Pebbled Salad Bowl 6"
$15.72 Winco PBB-18 Polycarbonate Pebbled Salad Bowl 18"
Showcase your side dishes with the Winco PSBW-5W Plastic Shell Bowl, Pearl 5 Qt. 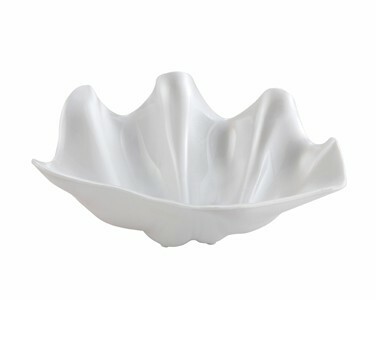 Featuring a unique design, this pearl-colored bowl will surely impress your guests at a buffet or reception. For outstanding durability, this bowl is made from ABS plastic that will withstand years of heavy duty use making it an excellent option for commercial food establishments.